1. TRIGGER IS STILL DEPRESSED. TRIGGER SEAR STILL FORWARD. 2. FORWARD MOVEMENT OF THE SLIDE PIVOTED TOP OP TRIP. LEVER FORWARD AS CONTACT WAS MADE. THIS CAUSES REARWARD TRAVEL OF DISCONNECTOR WHICH MOVES SEC. SEAR REARWARD ALSO. 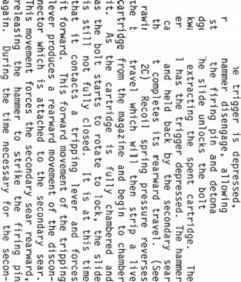 THIS DISENGAGES THE HAMMER TO STRIKE THE BOLT & FIRE THE CARTRIDGE. CHAMBER. THE TRIGGER HAS BEEN RELEASED, CAUSING THE TRIGGER SEAR TO ENGAGE & HOLD THE HAMMER AS THE SEC. SEAR DISENGAGES. REARWARD PRESSURE APPLIED TO THE TRIGGER WILL RESUME FULL AUTO FIRE.